Khluk Street Food uses their own specialised couriers to deliver their food. Spring roll, curry puff, fish cake, fried chicken. A classic spicy creamy Thai soup with a fusion of lemongrass, kaffir lime leaves and mushroom. Fragrant creamy coconut soup with lemongrass, galangal, kaffir lime leaves and mushroom. The most popular curry dish with green curry paste, coconut milk, bamboo shoots, Thai eggplants, green beans, fresh chilli and sweet basil. A curry consisting of red curry paste, coconut milk, bamboo shoots, Thai eggplants, carrots, fresh chilli and sweet basil. 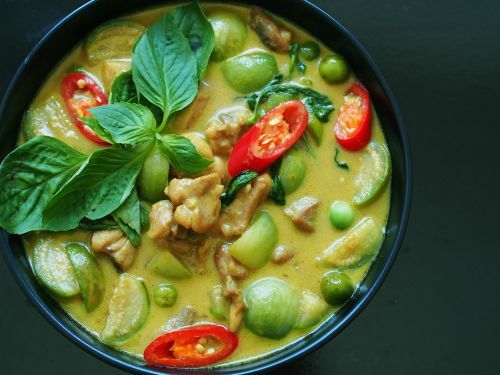 A type of Thai red curry that is thick, salty and sweet, with a nutty peanut flavour consisting of green beans, fresh chilli, carrot and sweet basil finished with shredded kaffir lime leaves. This curry is highly spicy and watery curry without coconut milk that has distinctive full taste. Ingredients include green peppercorns, lesser galangal, kaffir lime leaves and sweet basil. Slow-cooked braised beef curry with authentic Muslim style comprising of traditional herbs, e shallots, potatoes and peanuts topped with fried onion. Recommended with roti. Delicious BBQ roasted duck in creamy red curry cooked with lychee, pineapple, cherry tomatoes, green beans, Thai eggplants, fresh chilli and sweet basil. Simple but tasty, mixed vegetable stir-fried in oyster sauce with your choice of meat. Fresh garlic and grounded pepper with carrots, broccoli, baby corns, chargrilled onions finished with chopped shallots and black pepper. Your selection of meat and mixed vegetable stir-fried, topped with well-known satay sauce, roasted crush peanuts and white sesame seeds. Stir-fried mixed vegetable including Chinese broccoli and beansprouts with gluten free soy sauce. Perfect dish for gluten free and vegan lover. The classic flavour stir-fried with roasted cashew nuts, carrots, capsicums, broccoli, julienne ginger, onions, dried chilli and an authentic chilli jam. Wok tossed with fragrant sweet basil, fresh chilli, garlics, bamboo shoots, green beans and champignon mushrooms. Hot and spicy mixed herbs make a delightful stir-fry with fresh chilli, garlics, green peppercorns and lesser galangal. Fresh chilli stir-fried with combinations of onions, garlics and shallots. Soft and tender grilled beef tossed in spicy Thai traditional homemade lime dressing, cucumbers, tomatoes, red onions and mints served with fresh mixed salad, chopped shallots and chopped coriander stem. Aromatic mixtures of lemongrass, kaffir lime leaves, red onions and Thai mints with Thai spicy sweet and sour dressing. BBQ beef with well mix of lime dressing, mints, red onions,shallots,coriander, dried chilliandroastedricepowder. The most popular spicy salad from Northeast of Thailand with choice of mince mixing with lemon dressing, mints, herbs, dried chilli and roasted rice powder. Choice of seafood salad lover, absolutely mixed seafood, Thai herbs and fresh mixed salad with traditional Thai chilli dressing. Delicious BBQ roasted duck with spicy homemade dressing in coconut milk, coconut milk, coconut shred, crush peanuts, mixed salad and mixed herbs topped with fried red onion. Homemade traditional BBQ chicken served with Thai sweet chilli dressing. Crispy soft shell crab tossed with salt and pepper topped with shallot oil served with sweet chilli sauce. Secret recipe marinated wagyu beef with herbs and special homemade sauce served with roasted rice powder tamarind dressing. Most popular Thai stir-fried thin rice noodles with egg, palm sugar, tamarind juice and peanuts served with bean sprouts, chives and slice of lemon. Wok tossed flat rice noodles comprising of egg, Chinese broccoli and sweet soy sauce. Wok tossed flat rice noodles, with garlic, chilli, onions, holy basil, bamboo shoots and mixed veggies. Traditional Thai fried rice consisting of Chinese broccoli, onions, tomatoes and pepper flavour served with slice of lemon. Fried rice in chilli jam sauce with mixed veggies, dried chilli and cashew nuts. Ho and spicy fried rice mixed with bamboo shoots, green beans, chilli and holy basil. Southern of Thailand deep-fried crispy chicken topped with Sriracha mayo. Street style stir-fried holy basil with chicken minces and fresh chilli topped with fried egg. Crispy roasted pork stir-fried with garlic, chilli, onion, green beans and holy basil. Crispy roasted pork stir-fried with Chinese broccoli, garlic and fresh chilli. Deep-fried chicken marinated with Chinese wine, watercress nuts, red capsicums, shallots, fried dry chilli and cashew nuts served with homemade sauce. Traditional Singapore soup noodles and seafood with sambal chilli. Deep-fried fish fillet served with ginger sweet soy sauce with fresh chilli, chopped ginger and shallots. Traditional Singapore hokkien noodles with seafood topped with garlic chives that you can feel street hawker. Indonesion spicy fried rice served with prawns and satay chicken topped with traditional peanut sauce and fried egg. Malaysian hokkien noodles with traditional sambal sauce, prawns, chicken and tomatoes flavour. Spicy prawn paste in Indonesian style with Tofu, carrots, broccoli and green beans. Slow cooked braised osso bucco beef in authentic curry with cinnamon, star anised, bay leaves, eshallots, potatoes and peanuts topped with fried onions. Fried crispy maryland chicken with Khluk style yellow curry and sweet potato. Crispy skin roasted duck topped with Chines broccoli and tradition hoisin suace. Wok tossed wagyu beef with black pepper, garlic, onion, fresh chilli and Chinese broccoli in Vietnamese style.